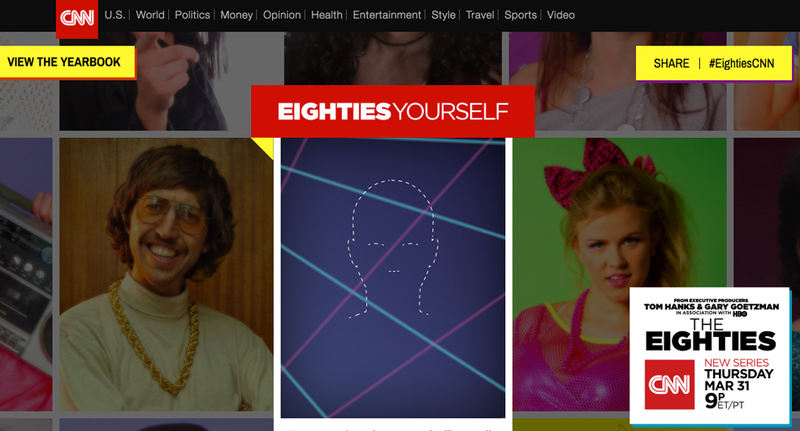 The network has already been promoting the series with content such as “80 moments from the ’80s” but this microsite brings a new level of interactivity and, CNN is likely hoping, virality to the promotion of the series. The tool lets you upload a headshot or use your computer’s camera to snap a pic. Then, you’re given the chance to add hair, glasses and accessories before the site applies a “groovy” 1980s filter to the image (which is a bit reminiscent of an over-zealous Instagram filter). Then, of course, once you’re all eighties-upped, you can share your masterpiece with the world and, if you agree to the “terms and conditions,” add the image to the “yearbook” (a fancy way of saying a user-contributed gallery).